BEIJING, April 8 (Xinhua) -- Beijing started a landmark reform drive Saturday that will separate drug sales from medical treatment at public hospitals, lower medical expenses and improve services for patients. As of 6 a.m., 2,605 Beijing hospitals had switched to a new billing system, which replaced a registration and treatment fee with a higher medical service charge but scraped the previous markup on drugs, which was as high as 15 percent in the old pricing system. The reform is applicable to more than 3,600 medical institutions citywide, while some 1,000 small village clinics are not yet equipped with computerized billing system, said Gao Xiaojun, spokesperson with Beijing health and family planning commission. At Beijing Children's Hospital, one of the busiest downtown hospitals, dozens of children and their parents at the emergency room shortly after midnight. One father, surnamed Zhang, said he had paid 10 yuan under the local medical insurance program to see a doctor, five times the former fee he had to pay out of his own pocket. "But it was not a big deal," he said. "We are quite happy that medication will be cheaper." A mother who was collecting a prescription for her child commented on the average drop of 10 percent in drug prices. Price changes were also seen across 435 medical services offered at public hospitals and clinics. The reform has reduced fees for the use of certain equipment, such as computed tomography (CT) and nuclear magnetic resonance (NMR), but increased charges for certain medical services that involve a lot of experience, expertise or staff time. 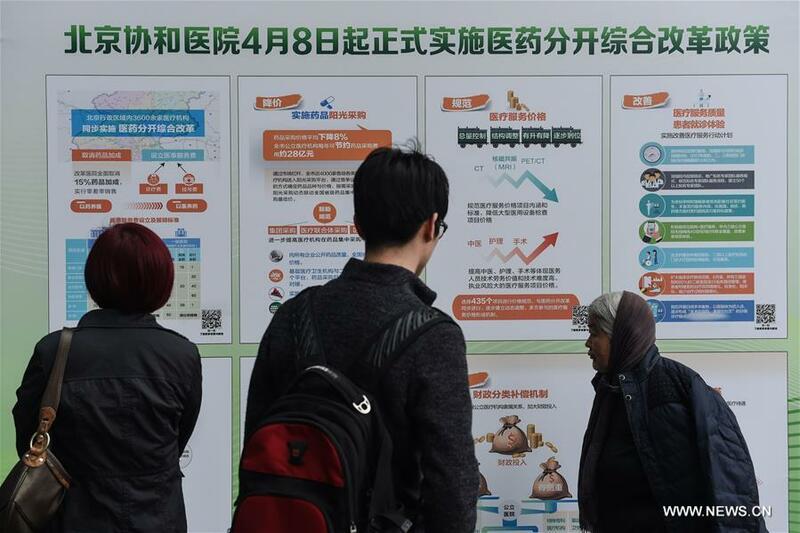 According to calculations, the overall medical costs for Beijing residents will remain balanced and there will be no increased burden on patients, said Fang Laiying, head of the Beijing municipal health and family planning commission. "Separating treatment and drug sales will stop over-prescription and help medical practitioners provide better treatment," said Fang. To ensure medicine prices drop, Beijing has mandated transparent drug purchases, choosing suppliers through open bidding and requiring the full disclosure of drug and producer information. Meanwhile, community hospitals and medical institutions have been given the same access to medicines that were once only prescribable by high-level hospitals. More than 90 percent of Beijing's hospitals have taken action to improve their services since the reform plan was published on March 22, said Fang.